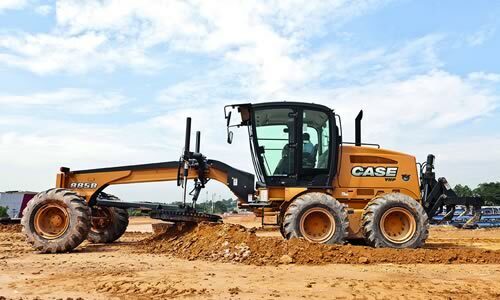 Case 885B series graders have low fuel consumption, turbocharged, high performance Common Rail Tier 3 engines. Case offers the ZF transmission, with a torque converter lock-up system, that provides an increase in torque of up to 70%. This feature is suitable for heavy tasks requiring extra traction and can be locked for less demanding work. When lock-up is disengaged by the operator at the push of a button, the transmission reverts back to working with the torque converter. Lock-up engages automatically to match torque and engine speed – as long as the pre-set electronic transmission module parameters are met. The Case de-clutch system, which is activated when the operator applies brakes, improves handling speeds for tools, including the blade, ripper and scarifier. This de-clutch system directs all engine power to the hydraulic system as at that moment the engine is disengaged from the transmission. As a result, loss of power during operation is prevented and fuel economy is improved. Another advantage of this transmission system is the option of operating in automatic or manual mode. The operator is able to manually shift gear or opt for automatic control. The Transmission Control Unit (TCU) manages all the input of data provided when the transmission is operating and ensures optimum performance, extended service life of the machine and also improved operator comfort. The transmission also has a diagnostic system that detects potential problems and displays them as error codes on the panel or via a laptop connection. Case 885B series grader axles have been designed for improved traction on the ground. The front axle has a welded steel structure with high resistance cast iron components. The straight line geometry offers 580 mm ground clearance over the machine’s entire length. The wheel lean angle is 12° to the right or left, with up to 15° of oscillation to be able to cope efficiently on irregular terrains. The cast iron tandem type rear axle has a welded steel plate structure that enables safe operation in difficult conditions. Tandem oscillation is 20° to each side. The hydraulic system of this series is designed for complete precision of movement and blade control. When ground resistance is high and the hydraulic system pressure needs to be increased, the load sensing system reduces hydraulic flow since the machine needs force and not flow. Brakes are oil bath cooled self-adjusting, multidiscs with one circuit to each side of the rear axle. This ensures precise stopping power and extends service life of components. The orbital valve hydrostatic steering is powered by a gear pump and provides a steering angle of 48° to both sides. The turning radius is 7, 250 mm, which enables the operator to perform tasks efficiently in restricted areas, with faster steering. The ROPS/FOPS feature offers maximum safety and protection against roll over and falling objects. Both open or closed cabs are mounted on the rear chassis, which enables manoeuvring from the rear, as well as direct control over the degree of frame articulation. The new design of this series is more rounded, with an improved glassed-in area that provides greater all round visibility. The spacious cab has re-designed ergonomics for more space and improved comfort. All controls are positioned for easy access and fast control. The 885B series grader mouldboard, which is manufactured from score resistant, high carbon content steel, is shaped for material roll-off. The design of this robust mouldboard, with a multi-radius roll-away profile, minimises mechanical load, ensures effortless cutting, lower fuel consumption and extended component life. The blade circle has an unrestricted 360° rotation angle for optimum flexibility during operation. 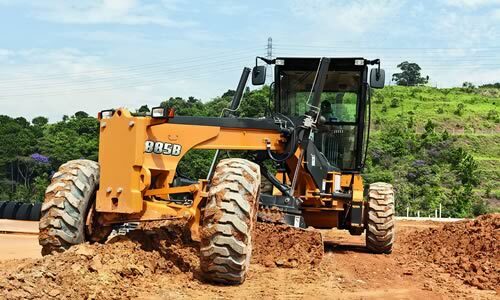 CASE Construction SA supports its range of loaders, backhoe loaders, excavators, telehandlers, skid steers and graders – with a technical advisory and maintenance service throughout the country. Operator and mechanic training is also provided. 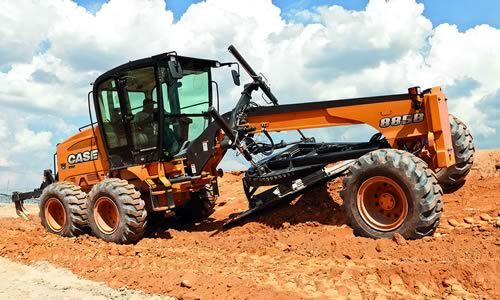 Case 885B series motor graders – available locally from CASE Construction SA – have the latest technological and design features for improved performance and enhanced productivity.